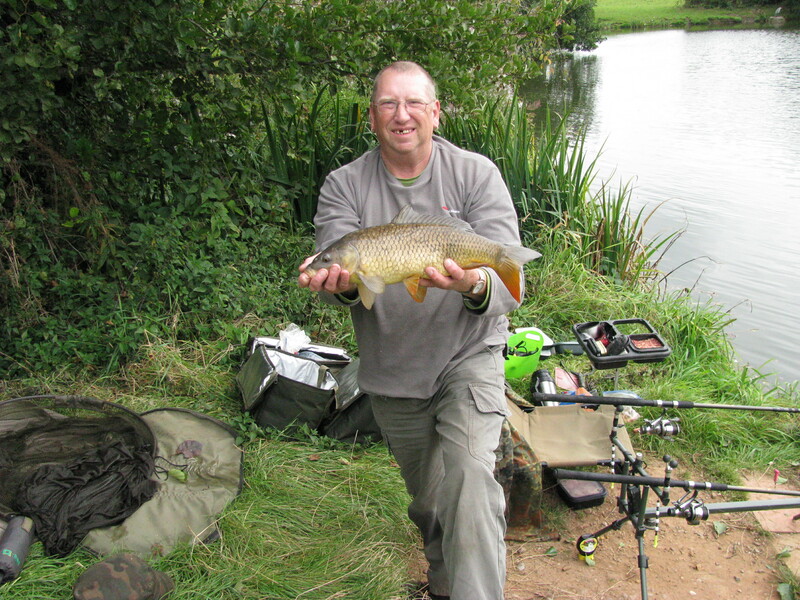 Session 47 – Carp And Bream – Roach For Some People too!! Friday, September 12th, 0730 and Liz and I set off to one of our club’s pools in search of carp and bream. Only a short drive away and so we were at the water’s side, in our desired pegs, tackling up by 0815 being the first arrivals. Later in the day the crowds arrived though … another two anglers!! LOL! … and the four of us had the pool to ourselves all day. Action was steady throughout the day with Liz bagging 8 common carp to 4lb 8oz, 1 mirror carp 4lb 7oz, 4 bream to 1lb 11oz and 2 roach of around 4-6oz. Myself, I had 7 common carp to 4lb 0oz and 3 bream to 1lb 10oz. Chronological captures listed at the end of this posting. Both of us fished by legering with two Grandeslam 11’ Super Avon rods (1.75lb TC) with 8lb mono mainline and 8lb braid hooklengths. I used straight 1/2oz leads and catapulted out small groundbait balls laced with particles throughout the session and Liz used small swimfeeders with groundbait/maggot feed. Hook sizes varied to suit bait for Liz – size 12 for maggots and size 6 for luncheon meat – whereas I used size 6 all session baited with bread, spicy sausage, cheeseballs and luncheon meat. 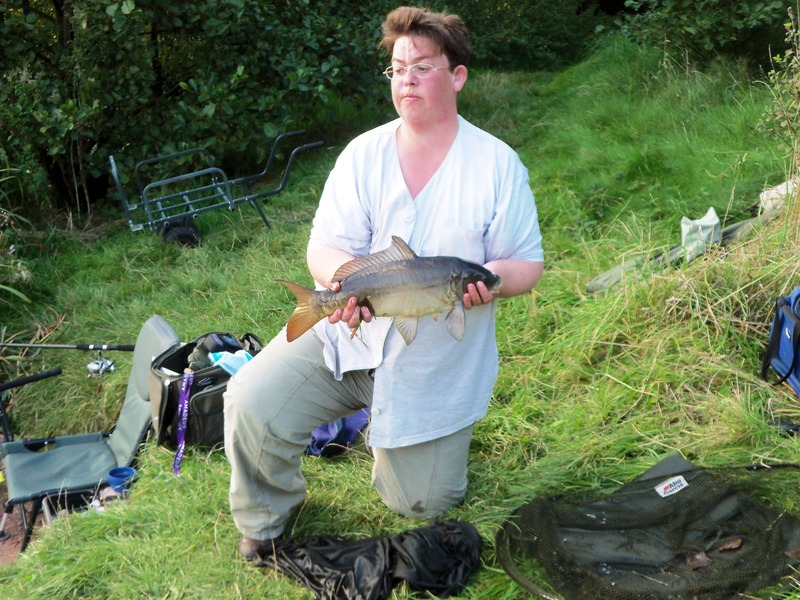 Liz with 4lb 7oz Mirror Carp – almost a Leather. First into action was Liz, and in fact she had the first two fish of the day – a carp and then a bream – before I started my ‘batting’. Most of Liz’s fish came on luncheon meat (well, Chopped Ham with Pork it was to be pedantic) but I couldn’t get a decent bite at all on it despite being in the next swim, any attention to my meat baits taking the form of quick short bobbin lifts…. but bread was a different story for me, at times I was attaching the bobbin to the line and the line was being snatched away out of my hands! Anyway, at 1645 we decided that we’d pack in at 1730… but, hooking a fish 10 or so minutes later that swam over my second line and tangling the two sets of tackle into an extreme knot that required cutting out, I decided it was not worth re-setting up and started to pack my tackle down. And meanwhile Liz had, in the shallows, the attentions to loose feed she’d been laying down there of a good sized (a good double, possibly upper teens) carp… so she stealthily set up her tackle and laid her baited hook in the area … and hooked the mirror carp which had, along with a third fish, had joined the first… Obviously, the disturbance of hooking and landing this fish caused the others to leave the vicinity… but Liz continued to feed and fish and had a couple of small roach and not long after Mr Big returned… and was induced to take Liz’s bait… and unfortunately Liz had the anti-reverse of her reel switched on and the shock on the line as the fish shot off like a bullet was too great for the drag despite it having been set for normal fishing (ie at distance where there is give in the line to lessen the shock and allows the initial inertial resistance of the drag to be overcome) – but at less than 2 metres from the rod tip then there is less give and the shock more severe and so the line broke… At this we decided to call it a day as it was probably approaching 1830… but whilst tackling down Liz’s gear the fish returned and was happily munching, along with a companion, the maggots and groundbait in the margins. And the day ended with a quick pint in The Station, Codsall on the way home.